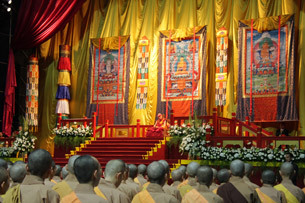 The Dalai Lama leads a prayer gathering in Taiwan, Sept. 1, 2009. KAOHSIUNG, Taiwan—A Taiwan visit by the Dalai Lama has drawn an unusually mild response from China, which has historically condemned foreign visits by the exiled Tibetan spiritual leader in strong terms. Speaking to reporters here, the Dalai Lama called the purpose of his visit “humanitarian” and “spiritual,” with the aim of prayer for victims of a natural disaster. “From my side, I have no political agenda,” the Dalai Lama said, adding that he had no plans to meet or speak with government figures. Typhoon Morakot, which struck Taiwan in early August, caused mudslides and massive flooding across the southern part of the island, killing hundreds. “My main reason [for coming to Taiwan] is to see those people who lost family members and homes,” the Dalai Lama said Sept. 2, a day after leading a prayer gathering of 10,000 in a sports stadium in the southern port city of Kaohsiung. Taiwan’s president Ma Ying-jeo, of Taiwan's Nationalist Party, was widely criticized for what was seen as a slow response to the disaster, and the opposition Democratic Progressive Party (DPP) later invited the Dalai Lama to come to Taiwan to lead prayers for the storm’s victims and survivors. Though he risked Beijing’s wrath, experts say, Ma had to allow the visit to rebuild his reputation at home, where the Tibetan Nobel Peace laureate has a large following. Ma meanwhile denied charges made in India by the Dalai Lama's nephew that his government had placed a "gag order" on the Dalai Lama, urging him at China's request to limit his appearances and public statements while visiting Taiwan. Beijing sees the Dalai Lama, who fled into exile after a failed uprising in 1959, as a dangerous “splittist” committed to seeing Tibet break off from Beijing. But Ma has enough political capital with Beijing—which has frequently rattled sabers at Taiwan in the past—that the Chinese response this time was mild. Beijing voiced opposition to the Taiwan visit, but it responded only by canceling several low-level exchanges with the self-governing island, which it views as a breakaway province. In office for just over a year, Ma has overseen agreements on transportation, trade, investment, and cultural exchanges that clearly hitch tiny Taiwan to China’s growing power. Richard Bush, director of the Center for Northeast Asian Policy Studies at the Brookings Institution in Washington D.C., said that by allowing the Dalai Lama’s Taiwan visit, President Ma Ying-jeo risked offending China. “But because of the problems with the response to Typhoon Morakot, his domestic political standing has been hurt seriously, which undermines his ability to continue his agenda on [improving] cross-Strait relations,” Bush said. In return, China “calibrated” its response, said Robbie Barnett, a scholar of modern Tibetan studies at Columbia University in New York. “If it attacks Taiwan, it pays a price,” he said. Original reporting by Dolkar for RFA’s Tibetan service. Tibetan service director: Jigme Ngapo. Translations by Karma Dorjee. Written in English with additional reporting by Richard Finney. Edited by Sarah Jackson-Han.